Rising electricity prices, government incentives for promoting building energy efficiency as well as growing awareness amongst end users regarding sustainable development and environment related issues are the key drivers which would fuel the market for building energy management systems (BEMS) in the United States. According to 6Wresearch, United States building energy management systems market size is expected to grow at a CAGR of 12.2% during 2018-24. Several advantages of integrated BEMS hardware and software system includes: budgets & variance reports, utility bill tracking, real-time metering and collection of energy data usage by various equipment such as heating, ventilation, lighting and air conditioning, making them quite popular among residential and commercial users. Government initiatives such as Southern California Edison (SCE), and App Lab coupled with promoting the use of LEDs and CFLs in all residential, commercial and industrial sectors would further fuel the United States building energy management systems market forecast period revenues. According to EIA, industrial energy consumption is projected to rise in all three main sub industrial areas namely, non-manufacturing, energy-intensive manufacturing, and non-energy-intensive manufacturing. Rising electricity tariffs are also making industrial and manufacturing players lean towards building energy management systems and the industrial sector is likely to acquire highest United States building energy management systems market share during the forecast period. 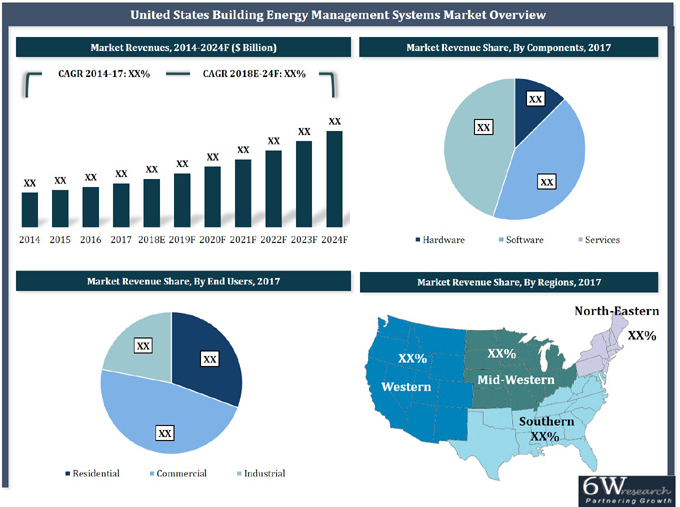 The United States building energy management systems market report comprehensively covers the United States Building Energy Management Systems Market by components, hardware components, end users, applications, and regions. The United States building energy management systems market outlook report offers an unbiased and detailed analysis of the United States building energy management systems market trends, opportunities and market drivers that would help the stakeholders to design and align their market strategies according to the current and future market dynamics. 15.7. Lucid Design Group, Inc.